I love this app! I can quickly and easily find the scriptures during church service. It’s so user friendly that my husband even loves it! Easy to use! Such a blessing! This has Strongs and great (not monotonous) audio. So worth it. Thank you guys for providing us with such a great product. I’ve used this app for a few years and find it a convenient way to read the Bible. I like the auto scroll feature. I use the highlighting to mark where we are at in family devotions. Thank you! It’s good to have a digital Bible that has ALL Verses and Chapters in it because there are some Bibles that like to cut things out. This is wonderful!! Exactly what I was looking for! God is so faithful!! Thank you!! It is so easy to find verses in and there so much you can do with it! You can write notes on just one verse you can highlight to! For it being the King James Bible it is truly amazing! Gods Word is truly amazing in and of itself! There is nothing like sitting down and reading the Holy Bible! It is so fulfilling!! Concordance Update is Full of Lies! I've been using this app for years and have recommended it over and over again during that time. I will uninstall (as soon as I can get my many notes copied) and will no longer recommend this! The new Concordance update is close to being Anti-Christ - in fact it is in many places! A few examples of the lies: Colossians 3:2 KJV  Set your affection on things above, not on things on the earth. *Affections does NOT mean "mind", but that what the Concordance wants you to believe! Genesis 3:5 KJV  For God doth know that in the day ye eat thereof, then your eyes shall be opened, and ye shall be as gods, knowing good and evil. *Our father God in Heaven and little "g" gods are NOT synonymous! They are as far apart as the east is from the west! Matthew 3:7 KJV  But when he saw many of the Pharisees and Sadducees come to his baptism, he said unto them, O generation of vipers, who hath warned you to flee from the wrath to come? *A generation is not a "brood", like the Concordance states! Very easy to navigate. Easy way to get around the Bible. Long press on an underlined word and it gives you the choice of what to do with that word and how it could apply to the verse. This is an easy read. It blesses me everyday. Teach more about the Lord’s word. This is the best bible app ever. I can go to whatever book of the Bible,whatever verse in just three taps. How awesome is that. And if I see a certain verse I want to dwell on, all I have to do is highlight the verse. WOAH!!!!! The only reason that I did not rate it 5 stars is because I don’t rate anything 5 stars, because nothing is perfect like Jesus. And if you guys could fix the delay of loading screen, that may get you guys to 4 and a half. Thank you and have a nice day!!!! Best Bible App there is! Literally the BEST bible app there is! Only downfall is there's a few pop up to get you to buy other bible apps but other than that you can't find a better one than this one! I am very impressed on the ease of using this app. I find this Bible app to be easy to use. I recommend it to anyone that has a need for a study aid. Love the built in Strong’s! 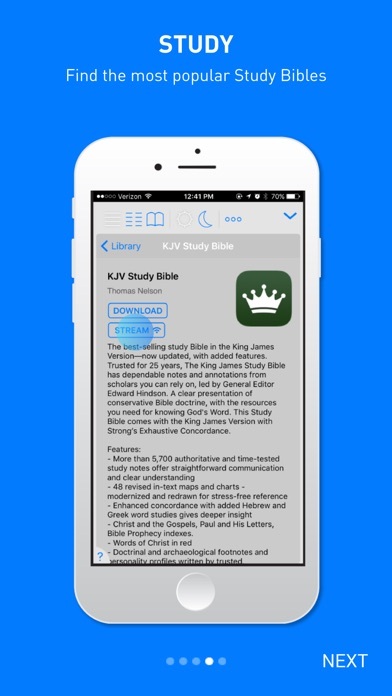 Great free app, easy to use during study, love the free built in Strong’s with the kjv. Thank you!! With all the latest upgrades, it’s like having a companion bible, with that said, I’m able to gain a better understanding of the word. Enjoy Reading, very user friendly! An excellent way to reconnect with your faith. After looking at other Bibles I believe that this is the best KJV Bible in the App Store. It is very easy to use and I especially love the fact that I can highlight words, phrases, and whole verses in different colors, as well as take notes. Praise God! I have used this Bible app for sometime and I like many things about it, very to use and simple. Essential app for living a full life. Often I find the app open, of it’s own accord, to a passage that speaks directly to my troubles. This app is so user friendly that my kids use it during church to highlight the passages for the day. We can go back later and discuss what they mean to us in our lives today!! I would recommend this app to anyone. You won’t regret it! It will sync with most all devices that you can download the app to. It is truly a blessing to have the word of God at my fingertips. Easy access to my head and heart! I have used many different Bible apps but this one stands out as the best. Helps me greatly in preparing my sermons in the note section as I study. The daily scriptures are broad and also well selected. OSE SAINT EKOH. It is really easy when the entire books are optional on the phone screen like it used to be. Use this app every Sunday. Easy navigation. I love it! Very user friendly. Entices you to read more and more. Able to download the kjv audio and play offline!!! Suggestion would be to have higher quality voices but better than having to stream. Very easy to learn the word of God using this app. You can access other part of the app at your convenience without complication. I love the featured stories that is shared on them. There’s a lot to learn and to grow in grace using this app. I love starting and ending my day with these amazing words! Fantastic bible! Easy to use! Great study and worship tool! Exciting! Easy to use and great a way to study the Bible to get a understanding. Love App I use all the time. I have purchased several versions of the Bible. BEST APP I HAVE SO FAR I LOVE YOU LORD ! So easy to maneuver, I love this app! This app allows me to bookmark certain verses and categorize them. Finding a passage is very easy with the wheel option, and there is an audio option for the verses. This is my one and only Bible app!! Excellent app! Easy to use. Great app. The search feature can be a little more user friendly. Other than that it's a great app. The Tecarta loads quickly and moves smoothly from one book to another as though using a hard copy bible. I still like to use the hard copy; but this is more convenient in dark room reading. Love reading the word to guide and start my day. Tecarta is a wonderful Bible app, with ease of use & great features, including the Strongs Concordance. I love the daily scripture & devotional accompanied by the beautiful photography! I highly recommend this Bible app!! I tried listening to the Bible and it said that I didn’t have a internet connection, which I did. Then the only way I could get it to play is to listen to a woman’s robotic voice. Very irritating. Deleted the app! This should be a 5 star review. Still having major issues with removing highlights and sending inquiries or requesting for assistance directly on the app. Please fix. Otherwise it's a wonderful Bible app. Blessings to the developers...continue on with improvements. Not much too say. Can't be beat it. Easy to search topics and navigate. Love the audio! I’ve told many people about your wonderful bible. I thank God for this great tool available to all who want a deeper walk with our Lord. The daily Word of the day gives us direction on how to study the bible. Thanks for making reading my Bible easier. Great for daily reading and recording. I love the layout! I love the different commentaries! And lots more! Whether seeking a closer connection to God or just wanting to check a reference, Tecarta makes it possible to have the most famous version of the Bible instantly available. I will continue to leave 5stars for this app. I’ve had this app for years and it has never failed my expectations!! IF YOU DON’T HAVE THIS APP INSTALL IT NOW!! I have found that this app makes it so much more enjoyable to read God’s word and then sometimes you just don’t feel like reading and you can truly still get your Bible because you can just listen to it so this app has been wonderful to me I advise anyone and everyone to get this app. This app once offered a nice digital Bible to reference on the go or have played in the car. Now they charge for audio. No thanks. There are better Bible apps that give High quality Bible reading for free. I love having the Bible on my iPad. It has helped my son follow the sermons in church and, because I have the iPad with me all the time, I also have the Bible with me constantly. A great use of the technology the Lord has blessed us with. Useful and correct information, easy to use and read. I love being able to have the Bible on my phone and I love the daily inspiration reading. I used this app for many years I absolutely love it. Easy to navigate and saves a lot of time searching the scriptures. Next to my bible this is a great tool to use. The features i like about this app are the highlighting and book mode. I also love how easy it is to highlight passages and copy them to be pasted in other apps. The concordance feature makes studying faster and easier! Look forward every morning for my word God bless everyone who is involved in this ministry continue to win more souls for Christ. Thank you be blessed!! This app is amazing. I’d go here to read the daily scripture, but since the last update the pictures won’t load on my phone. I’ve deleted the app and downloaded it again but nothing seems to help. Maybe it’s my iPhone 7 Plus, or network or the app itself. I am used to seeing the pictures with the daily scripture and devotional of the day. Sometimes it seems hard to get to the place I want to read. The app stays updated and I can always use it, other bible apps didn’t follow apple updates, I have not had those problems with this bible app. Awesome ministry tool. Tecarta Bible is an invaluable resource for study and message preparation. Love this app. Especially since they added the feature where you can view the footnotes and references with pop ups without leaving he current page! Really makes the experience much more enjoyable. Have used this app for a long while now now. This and “Bible Is” dramatized bible is the first bible apps I go to. Way to go! Thanks for a great app. I have been using this bible app for years! Easy to use, and so many tools to help you find the scripture you’re looking for. Best and easiest to use I have ever seen! If you hold on a word thatIs underlined, it will “other scriptures that ties into that. If you hold on a little letter beside a word it gives you a better Definition of that word. A wonderful tool. I use it often. It is a tool that can be used by all on the go and not worry about bring books. It is easy to use, makes it very easy for my studies. And I love it. This brings the Bible to life! I love hearing the story with different voices - adds a lot to the understanding! Thank you!!! Not boring and good narration! This has been a great app to use plus I love how it can be an audio version to. Because if I'm in a rush or I just wanna relax but also read I can just do that. And I can carry around just my phone instead of a Bible, highlighters, and my phone I can just have my phone and the rest of the features are on the app. And there is a New King James Version and the older one. If someone likes to study both or prefers one version over the other. This bible provides a Strong’s concordance reference. There are many translations available at very low prices. The split screen is invaluable as it allows viewers to see two translations at once. I own the amplified, version the new living translation and the king James and no matter what device I have I will always have them and my notes and comments. No more lost wet damaged bibles that are expensive. I use an iPad 10.5 with a heavy duty case and premium screen protector so in a sense my bible is 10.5 x 9 and 1/2 inch thick. It is a perfect reading medium. When ever I want to meditate on the Word of God or be reminded of his love for me and this world this App has been all I need. The ability to write notes and mark references is just another one the great features of this App. I love it!!! This app comes in KJV and also has other versions so you can compare (I suggest Matthew 17:21 NIV). The other versions you will have to pay a fee for. It also has an audio feature so you can listen to it read as you go along. It isn’t just straightforward reading either, it has different people read the different parts to better understand who is speaking and what is going on. It also has background music! Need I say more? You can highlight in 4 different colors, underline, take notes, and copy one or multiple verses at once with a three taps on the screen. You can change the way you locate different passages and search by keyword. I love the way it floss as the audio reader reads it ,it moves all by itself.I also love the way you can change the voice sound from man or women.You can also save your highlights, look up information save it and come back to it. And there is so much more. If you are looking for a good Bible App ,will this is it. This is a great app! Are used my sword on android, before I purchased my iPhone X and I really liked my sword and I could download free Bibles and appendix is like the companion Bible and all the appendixes by Bullinger. Of course this app charger is for the Bibles and I do not see the companion Bible available. And there is a website that allows you to download Bible’s for free but you need an installer program to install them with e-sword. Also I was wondering why the King James version does not have the parallel versus at the end of each verse where I can click on and read it like MySword does. I really love this app but it needs to have those verses in parentheses at the end of each first so I can read the parallel verses that it would be a 10 star app thank you. Full of second hand information, violence and encourages promotion of ignorance. Spoiler alert: it's about a guy who is God, made himself human by impregnating a virgin, then he kills himself to save humanity. However, he won't save everyone unless you "believe in him." This God does nothing to stop unthinkable horrors on Earth even though he can. How cruel? I recommend a book called The God Delusion for increased insight and perspective. I love this app it is so helpful!!!! Love it! Love it!!! Basic instructions before leaving earth. All about GODS power and love and mercy. Thank you JESUS!!! I use the app daily. I especially like the recent update. Highly recommend this app. Thank you. Would give five stars if it wasn’t missing the king James apocrypha many other Bible apps have it except this one. I have used the Tecarta Bible App for 2 years now. It is so easy to use and many translations available. Also Commentaries, study bibles, and all of the editing tools for text. I have most of the others on my phone, but Tecarta is the one I use most! I love this app. It is easy to find the book and chapter you're searching for because of the wheel that allows you to see the books when you spin it. I can't think of anything negative to say about this app. I just love it. When you fully use every tool in this app it will be the only app that you use. I use this for all of my Bible study days. Great for the resources, great for studying, great for multitasking, great for simply learning. I love this! I love it has study tools an several versions. KJVis my favorite. Tecarta makes great Bible tools when it comes to highlighting, bookmarking, adding notes and of course synchronizing across devices. I love it lots and deeply treasure this release of KJV on Tecarta. Best part is having all my purchases under one APP so I can switch translations with ease and compare across translations side-by-side. This is great for productivity as I get more time in the Word. Just a mention of the Bible Study Tools: they are subsidized in price vs a Print Edition at the Bookstore yet offer all the detail in a nice cross-referenced manner. I must say; Tecarta makes the best. When I can’t sleep at night,l read God words and I feel so comfortable as if the lord wrap in his arms around me and like me know he love me. It is user friendly and easy to find any book in the Bible in any version. Amazing! This app helps me do my daily devotion! ❤️ you should get this bible app if your at work a long day and get on your phone to read the bible. Enjoy reading the Bible which is at my fingertips! Great Job! I don’t have any issues with it, other than occasionally having some trouble texting people bible verses. Other than that great job! Got’s to have it . My day is not incomplete unless have my word, early day !!!! I LOVE THIS SO MUCH ! Although nothing replaces a hard copy of the word of God, this app helps when you need to find that special verse or need some encouragement. I love this bible app! 10/10 recommend downloading it for your phone on a Sunday morning!! The bible comes alive and makes the understanding more enjoyable. Simple to use, clean interface and very user friendly! Simple and easy to use. I love paper and leather but even holding a bible at church I often have my phone out to use this to search a verse I can’t remember or didn’t hear. During that the day it’s copy and paste is handy during Facebook discussion and debates. This is an amazing app. Research and great reading. This is my go to Bible not only when I’m working off-line but also anytime I need to search it has really accurate search mechanism. I really love it! It is very easy to use. I find no reason to use another online Bible! There are two things I wish this app did better, and I'll acknowledge that it might just be something I don't know how to do. 1) I'd like to be able to read different translations side by side. 2) I love the way the app pushes a verse of the day, but I'd prefer to set a time for it to pop up on my phone. At 8:00 I'm usually driving. This app is simple enough to learn and use easily, but still has lots of great features. I've used it over a year and I'm very happy with it. I love the many functions of this app. I enjoy listening to the audio bible and keeping Bible study notes in file folders. The 1st thing I do each morning is look in your app for the verse of the day! Have my phone with me everywhere I go therefore I have the word of God with me at all times also, love it! This app has many functions. Whether one want to listen to a single male or female voice to read the scriptures as you read along or a dramatic reading is preferable. The accent may be changed as well as the spread of the reader. One can easily share and take notes as well as change the font and font size. Side by side commentary is also an option. This is my favorite app. I have used it for many years! I have tried others, but this one is still my favorite. Blessings! There have been very key moments since I downloaded this app that the FATHER has used specifically THIS app and the “Verse of the Day” and “Daily Devotional”. One very low time of my life I had received a text from my husband telling me “things just aren’t working out” and he turned against me and his children. I begged GOD for hope and to give me a verse and HIS answer. I’ll NEVER forget it— the verse of the day was Deuteronomy 10.18. I’m not quoting the verse because in the app you can look it up. No verse could have fit that moment better for me at that time!!! I fell to the floor weeping in brokenness but also in gratefulness to my FATHER for the timing and message to me of the “Verse of the Day”. This is just one instance... there have been many more. THANK YOU! THANK YOU! THANK YOU!!! I could not search for things. This book is awesome! It is written clearly and I can understand it! I love the music and different voices used to amplify the experience. Love the layout very user friendly! As I stated that this Bible app is absolutely awesome, second I’m pleased to have it as part of daily usage. As enjoy hearing the music 🎶 in the background as the male voice reads each book of the Bible, the music makes hearing each chapter more interesting and enjoyable to hear. I just love my Bible app! I want to thank the maker of this app! Congratulations to you, a wonderful job. I have really enjoyed using the Tecarta bible app. I have used this bible app for quite some time and it has always been my favorite. I enjoy the ease of use and different versions that are offered through wifi. So far, I have not experienced any glitches in using the app. I've used other bible apps and they are very glitchy. But Tecarta has a very smooth operation. I like the parallel bible capability as well. Over all it's a very good bible app. However, I do miss one feature that was available that no longer is a part of the app and that is the history feature. You can go back to a previous scripture but you used to be able to see your complete history until it was cleared. This is definitely a feature that was handy and that I miss having available. like that it has the italicized words! How is the best electric bible even in the App Store. GREAT APP... Thankz to God...!!!! God bless, Have a great RICK HERNANDEZ !!! I love that I can do so much in this book of the Bible and how the words of God is in red? It’s great! Thanks so much for this app. I love this Bible App. I really enjoy this Bible app ... I can highlight or underline a scripture, it gives daily scriptures to read. I've been using this app for about 2 yrs now! Love the different voices for each person in the Bible! Really helps you visualize what’s happening! LOVE THIS BIBLE APP! Very easy to use and I love the scroll bar! Lord’s Word is on your hands! With great features to underline, highlight and listen the audio among many others! It is a great reading app with several different bibles to choose from making studying easy and informative. The audio is also a great tool. It’s a clear view when using this Bible app. It’s good and understanding. Makes well easily. I enjoy all the daily word and scripture.. I wish I could underline or highlight just a PART OF THE VERSE...or a phrase. Fantastic affordable way to have all you need in one place to study!! SO many features to help with notes, make folders for different subjects, copy, paste, parallel versions, audio...💯✅👌I have the KJV Study Bible downloaded into this app and it’s the EXACT digital version of my physical bible!!! How kool is that?! I also have BBC, Darby’s Commentary, KJV/Strongs and Young’s literal. It can’t get any better...of course until they add the JND version!! LIVE LOVE LOVE this app. I love having this app because I can read the word of God anytime and it gives me daily scriptures and a daily devotional. I have really enjoyed it and it has given me positive thoughts when I am feeling low. I also like the highlighting feature because I can highlight verses that are useful in my studies. The Bible in my pocket!!! I love having this app, because I have access to God's word at the touch of a button. The daily devotional scriptures are a plus which unfailingly speak to my heart. I can't believe such a wonderful tool is free, when the instruction it provides is priceless! This app is a blessing! Should be more in-depth study guide like BibleHub or BlueLetter Bible where it has Greek and Hebrew translations. Love listening to the audio feature. Best bible application Ive experienced. Well done, thank you and many blessings. Best Bible App , all my notes from church always transfer when getting a new phone ! I Love all the information and audio reading it helps me to pronounce all the difficult names and words and how I can hold a word and find out its meaning I LOLVE LOVE LOVE LOVE LOVE IT, it brings things to life. And it says me a reminder that I need to read I love it. I find tecarta to be one of the best free bible apps available. The many features and ease of use make bible reading a joy. Oh my grandson loves listening to the scriptures being read. Love it! Doesn’t hurt to read this one, font size options are a plus and audio doesn’t glitch on me. The KJV is the very best of the Bible translations! The ability to manually search passages via name, chapter and verse number is invaluable. I’m able to swiftly find my passages during service in real time in seconds. Also highlight passages and store them for review later. There are also minimal ads. Definitely a 5 star app. Praise god!!! As I stated that this Bible app is absolutely awesome, second I’m pleased to have it as part of daily usage. As I enjoy hearing the music 🎶 in the background as the male voice reads each book of the Bible, the music makes hearing each chapter more interesting and enjoyable to hear. I just love my Bible app! I want to thank the maker of this app! Congratulations to you, a wonderful job. Being able to take this bible with me is truly a blessing. I can read it anywhere and anytime. Thank you for your insight on allowing me and others to have access to it. The KJV is the only true version of Gods word. If you use any other version read them side by side. Study and show thyself approved! Everything that has breath praise ye the Lord! i think the app is greatly built but i dont appreciate that the default is kjv and u have to pay to use a version thats simpler, i dont really agree w/ it i dont think the bible should ever be of profit to others. Thank God for men that allow themselves to be use to bring the word to me in my hand thank you all that did this and also thank God for you. Easy to use all tools and books you have AND try the ones you might want to get. There are not allot of interruptions from app ads, but there is an offer for others you might need when you search something out. Very organized and useful! Love it !!! It is great!!! No problems whatsoever. I’ve prepared and preached my first 3 sermons using this app, it’s very simple,convenient,and getting better every day!!! I have chronic dry eye syndrome and have to limit how much i use my eyes. This app is a great thing for me especially since i love reading the bible and it plays a wonderful narration of the bible. I have decided that i am going to listen to the whole bible. SO easy to use any easy to read with the black background ! Love the way with the iPad 12.5 you can use the pencil And highlight area you’re reading or have read. The Bible application by Tecarta, Inc. is over and above any superlative I could use here to describe it. I have been using it now for a couple of years and it has transformed my daily Bible study. I still use my hands-on Bible loving the feel of the leather in my hands traipsing through the Word checking and reviewing the verses as the morning study takes me through the Word. However Tecarta allows me to take notes and save the study and messages in an organized manner that is quickly and easily accessed as never before. The method of keeping margin notes, not available in countless other apps and programs used in the past, allows quick access to a verse, inserting a note and keeping the verse and verses in a separate note that can be recalled by the search tool. This program has revolutionized my Bible note taking. Additionally the manual is short and simple allowing the application to be quickly learned. I hate the hundred page manual poorly indexed. Not so with the Tecarta application. It is a quick study, short and simple making the user adept almost instantly. The selection of Bibles is comprehensive along with study bibles, and Strong’s together with a nice selection of commentaries and dicitonarys. I pray that the author and all of the staff are continually blessed by the Lord as He makes his Word available to us through Tecarta. I pray also for a continual supply of electricity and support for the existence of this app. I love this Bible app. I use it daily. I enjoy being able to find the chapter and verse as the pastor is preaching. I use it conjunction with Evernote on my iPad Pro. I am able to copy the verses, put them in the notes as he preaches without having to flip thru pages. I would like you to make the “Passion” translation available as my Pastor is using that translation more lately. Thank you. This is a great tool to help maintain a relationship with the Lord and studying scriptures. I do wish it had an annual reading program. Please fix the digitized computerized sound. A lot of basic words are not being pronounced correctly. Thanks! Very easy to navigate and highlight! I love ❤️ Tecarta Bible! Easy to find reference and to copy and paste. Also easy to share nd to get helps. I'm pleased with this App. I have a new respect for the Tecarta Bible app now that I upgraded to an iPad Pro. I have always enjoyed the complete reproduction of all the footnotes, side notes, and cross references of my paper NIV Study Bible. But, now, with the ability to do side-by-side or floating windows on an iPad, it is wonderful to be reading a Christian study book, perhaps in the Kindle app, which doesn't support windowing, and be able to slide in the Bible app in a floating window to follow up on a Biblical reference that the book makes. I also used to spend lots of (enjoyable) time wandering through cross-references, with many page flips in the paper bible, seeing how ideas are connected and related. It's so nice to do the same in the NIV Study Bible content of the Bible app. Even better, the Study Bible notes are not frozen to the NIV translation. They will cooperate with any translation I switch to. Love this app, I like that it’s so convenient having it on my phone. I can read a scripture anywhere at anytime. Love it. The user interface is excellent and I love all the features. The font and verse separation make it easy on the eyes and I love the daily verse reminder and devotional. Love this app!! It has helped my devotional life and spiritual walk and relationship with God tremendously. Outstanding!! 1 request: I want to highlight AND make a note without reselecting scripture. I've used this app for years and enjoyed its ease of use but this new update with audio is amazing. I've recently decided to do a one year Bible reading plan and hearing the audio while reading along adds so much to the experience. It also helps to take more in as they use different voices for different people and use emotion instead of just a robotic voice. Plus it allows me to have the audio while offline and it's all free. I'm blown away and will be recommending it to all my friends. I love the daily verse highlight. Helps that it's on the front page. Highly recommend this app. I use it often. I think it is easy to use and very convenient. This app is the very best bible app I’ve ever gotten. So much to choose from as far as bibles and also devotional bibles. I recommend this app for all Christians as a bible. Easy to use. Nice extra features. Love this app! Very easy to use. Quick and simple to make notes and highlight passages. Great listening. The way the background with the music and different persons speaking different parts of the Scriptures. Gives it a real sense of being a part of the actual dialogue. It works really really well, i love the Bible verses you get when you first open the app too. I love how I can highlight and transfer to notes, very useful when listening to a sermon or studying. Also easy to look up passages or to search for specific topics. Thank you for enhancing my interaction with God’s word! It’s one of the best bible app I’ve ever had. Love the layout. I like your app I like it a lot. So easy to read and easy to purchase multiple translations! Highly recommended! Very easy to quickly find Book, chapters, and verses with bar at the top! Quick to learn and you can synchronize the Bible with the commentary you use. You can also highlight and more. I'm thankful for it. Doyle C.
This is become my new favorite Bible reading app. You have the option of electronic voice or a dramatization which my children love. Using this as an aide with my beginning bible study. Very helpful resource when you need to read or hear the Word on the go. I love to have access to God’s word at my fingertips and this app gives me just that! What a way to start your day with such a blessed encouragement!! Truly the best Bible app I have found, much better features and so wonderful for study! Highly recommended and much appreciated app! I use it all the time! Thank you for such a user friendly, study enhancing product! This has always been something i wanted, i installed it today and i just can’t contain the excitement. My knowledge of God’s word is surely moving to the next level. Love to be able to access the Bible anytime and bible verses for the day. Very insightful. Passage speaks to the things in life that we go through at one time or another. Is the only word that matters! There is a verse for every trial, every heartbreak, every success, every joy! This App helps me start my day with a positive mind. Read a scripture daily gives me understanding and help me get pass things, I go through daily. Love this Bible app but would you make the pages a sepia tone, make an option please as it is much easier on the eyes to read. Thank you! As I read the daily scripture and devotional I am comforted. God our father loves us so much. Very please with the ease of finding each book of the bible and also I love the search section for a word to discover a chapter of verse in the bible. This Bible App is Awesome!!! Nothing is better than the real Bible. This Bible App is very helpful when I do my Bible study like comparing one text to another. The Words of our God works in many ways. Praise God for those people who spent their time developing this wonder Bible App. Lets spread the Gospel!! It’s been the best thing since “baked bread “ 🙂 Especially since the app is in the order of the Bible. This helps me to remember where to actually locate chapter and verse. On the occasion when I would prefer to utilize the Bible in order to read. This bible app has so much to offer. It has the option to highlight a portion of a verse (something I desired in a lot of other apps that didn’t offer it) it has the concordance for you to use and to learn about the meanings of the word. I appreciate this app and will recommend it to everyone. This is a great bible. I love everything about it. The home page is fabulous. WOW I LOVE TIME INSIDE GODS WORD!!!!!!!!!!!!!!!!!! I love this app because I I have the word of God with me every where I go with easy access. Therefore, I am protected everyday. Tecarta is easy to learn and use with many features such as notes, highlighting important scriptures pertaining to a point or opinion and able to switch easily between translations and commentaries. Many versions of the Bible are at your fingertips. Two of mine are The King James and Living Bibles. The only other thing I’d want would that Nave’s Topical Bible be added. All in all though this something I use and refer to constantly through my daily walk in life. This makes the Bible so accessible. I love the audio (with sound effects!) and the verse of the day. Very inspirational! This was a great app to read the Bible, and though it has excessive junk in it, at least it does not have ads when I’m reading the Bible and it’s junk doesn’t pull up first when reading the text. It keeps the Bible close to me so I can Draw on the strength of God's word at all times. I really appreciated this Bible app but today they say it is being retired. Why? I like the King James Version. Thank you for your Bible app! I use it regularly for study and quick referencing and appreciate the easy way app is set up to navigate. Lost all previous purchases...Ripped off! When ever I come across the daily struggles of life and I need answers, guidance, or closure i can always find my answers here and he guides me threw my struggles and gives me my closure I need. If I can’t find it here my pastors of my church will show me where to find what I need threw scriptures in the Bible. I love this app, and how they offer new features from time to time, to enhance your studies. I could not image a bible app better than this one. It is simply awesome. The split pages, the different bibles, the study books, notes taking and tools to make it better and more organized than using the conventional methods. Your notes are easily found and viewed. Highlighting and underlining. How can you beat that. I really like reading two different bibles types at the same time on split screen and also the studying bibles in the same way, make studying the Bible easy and organized. Beautiful app. Very clear and easy to operate. I was excited upon seeing this app. KJV as it should be. I lay back to play Jude. Two secounds into it , although i listened to he whole chapter, i could not concentrate. Because of the music playing in the background! I was really dismayed......lose that background please and give us what we came here to learn......sighhhh If there is a way to play without the music accompaniment, please let me know !! Please!! I love this app and how it will read the verses for you! The only draw back is the voice and music with it. I prefer for it to have a normal tone and no music playing in the background. I love the highlighting and note taking ability. I just wished I had saved everything somehow before I got a new phone. Now, I start over on marking my verses. Oh well. VERY GOOD APP. I DON'T REGRET DOWNLOADING IT. This app is useful for studying the word of God. It has a wealth of information and commentary to assist you with your study. Love this app. Extremely useful and is used often. Recommend it to have the WORD @ your fingertips. I really like this app! I can look up the definition of a word, highlight one or more words, and receive the daily verse in the morning! I also enjoy sometimes listening to the audio version. I like that it’s a little dramatic, although sometimes it’s a little overdone. Overall, it’s a great app! It is the best bible app that I have found and used to this day. I really like this app because not only can I use it to read but the search feature is fantastic! Always awesome to use without glitches or hiccups. A must have for daily use. Easy to read, intuitive, and structured appropriately. Also daily devotionals and the verse of the day! God’s word on the go! I love ease of app and being able to quickly access scriptures on the go! Great app! Love the audio! I listen to this while working and driving. The audio is very engaging with music, sound effects and many different voice actors who speak with feeling and robustness! What a great way to read & listen to your Bible and watch it come to life in a way you never realized before! Each verse just captivates your attention as the voices spring to life and present the Word of God in such a realistic, impressive way! Highly recommend for those who want to enjoy God’s Word like never before! I wish u had an amp-flied, I love reading this bible especially at night because I don't need a light or a lamp on to read it. I really like the connivence of the app! Technology can be a great thing! The daily scripture seems to be so encouraging!!!! I really enjoy studying the Bible in audio. It’s fantastic and spiritual. First time using it and I love the easy copy and paste of scripture verses onto a note folder. I was able to forward it or print it. It was empowering. Thank you for the design of this Bible. Very easy to navigate. Quick access during a service to Pastors comments need to be quick to mark accurately. I Love this because I watch a lot of YouTube Bible Lectures and really enjoy how quick I can move from say Genesis 7 to 1Kings 22. Plus the quick access to Strong's Concordance. Not to mention the multi color highlights and note taking! I use this bible app a lot.Very useful.Daniel 12:4 says “knowledge shall be increased”.I thank God for “Technology” and his son Christ Jesus. Awesome app but not my one stop shop maybe one day, keep up the good work! Easy to use. Well planned layout. It has blessed me in my preaching. Very handy, easy to use. You can highlight verses in different colors, which I find to be a very handy feature. I enjoy reading this Bible. I am visually impaired, so the voice enhancements makes it easier for me to read and follow along. You can also opt to use the dramatization feature as you read. This Bible also scrolls as you read at your desired pace. I also appreciate seeing the words of JESUS in red. This electronic King James Bible is true to the 1611 Holy Bible. I like the different versions, which can be cross referenced. It is an excellent Bible that I believe you’ll love. It’s worth the download. Great bible to have with you always. Easy to use. Love it. This is the best Bible app I’ve found. My favorite part is the narration. I still love this app, but I once loved it more. The home menu seems useless. I originally cherished this app above others, like Olive Tree and You Version, because of its simplicity. Now, I experience frustration each time I open the app and have to wait to close the home menu. I just want the Bible plain and simple. Thanks for the convenient and discrete King James Bible. What a wonderful app. It is ready and discrete at all times to fit our busy lives in the modern world. God’s Holy word at the touch of a finger day or night with a search engine to pull up any verse if a single word is known. It is truly a powerful piece of armor for the sword of truth. I LOVE my KJV app.. When I'm just sitting around at home or on the go I'm always able to read Gods word. Not only do I get to read but find meanings to words I don't understand, and hi light verses or words. It's awesome, I love it. I love this app. It is a great way to take my bible with me without packing my actual bible and risking bending it and ruining it in my purse. High recommended. The perfect app to go with the perfect BOOK! Wish the icons on the bottom were a little easier to access, maybe bigger icons or relocate them on screen. So easy and convenient to use! Really helps when studying! Love having God’s word with me all the time. I can find any verse I need in a blink. Always ready to answer for the faith that is in me. Yes! It gives me all the translations and versions I need. It even allows me to view two versions side by side for comparison. Best thing I ever had. Wake up with God’s Words LOVE IT! Yes!! Waking up and start reading the word of God is the Best when you open your eyes!! I read, meditate and share it!! Is a Big Blessing!! I enjoy the ability to have any two different translations parallel as well as the commentary and reference with highlighting. Great for when you don't have your printed copy's close by. Although this app is good, I still haven't figured out how to share / invite friends. Yes it's KJV with options for the perversions, but the daily devotions are NOT KJV, very disappointing. I truly do love this app! You see I am bed ridden a lot w a neurological disorder, so I am in pain 24/7, so there are days it is just hard for me to read. With this app I have the freedom to listen.I can relax and listen to Gods word and ask Father to wash His living word over me to give me strength, whatever is my struggle that day and He is faithful each time. Even when my pain is manageable, I still listen and read along, it really brings it alive. Five stars for this one!!! Helpful in all ways. Convenience adding more material! Love the tools given to keep information clear and/organized. I love having my bible on my phone. It's always with me and I know that I can open it any time. It is a user friendly app for home, office, and church. The latest update is great with the change in the font. I especially like the notes. Awesome app, easy to use!! I love the ease of going from one Book, Chapter & Verse without making mistakes. This is my favorite App. Love that I can read my bible anywhere I go with ease! Something upgraded recently and now there are adds. For betting agencies. Yuk. It says ‘get rid of adds for 99c’. I feel like I’ve been hijacked. If they want to put adds on, fine. But they should tell me first, not do it and then tell me I have to pay to get rid of the adds. When that change happened it also got rid of my NIV version. That was rude too. I think I’ll look for another app. Sorry Tecarta. You lost me when you made me feel like I HAD to pay for something I didn’t ask for or want. I love this bible app, I really love the update! It now does devotionals and scripture of the day! I also love the built in cross feature that allows me to further learn more about concepts. I have always have it on my phone and will continue to. A god send! Thank you! Use this app at the gym in the morning. Makes workouts more enjoyable if possible. The lord and me time. Good app. A fantastic tool in Bible study. Direct links to Strongs and word meanings. Easy to use and read. You can search and find scriptures very easy in this app. Great app to take notes during classes and sermons. Easy to pull scripture into notes. I enjoy verse of the day and the devotional. Bible translations are awesome. Love that I can play and listen to chapters or a selected verses and even play and repeat over and over. You this so much for my kids to learn bible verse. This is a great app to read the Bible on. I've even purchased a study Bible with it even though I already own the Kindle version of the particular study Bible. One thing though is I wish there was an option to download the dramatized audio of the KJV instead of only allowing access to listen when using cellular data or wifi. Otherwise I would rate 5 stars instead of 4. This app is a blessing to me when my eyes get weak and can't read I am able to listen any where I am this app is such a great blessing thank you. This BOOK is better than any movie! I have felt the Lords presence touch my heart while listening to the Word. The voice actors have done a remarkable job telling the story. This, the audio, helps me so much studying the Way. Very easy to use, and I love the commentaries that come with it. I can study the Bible and break it down to find out the real meaning of a word or verse. My son is disabled and he can’t read that will and this app will read it to him and help him to the understanding that he needed. A review of your app! Very helpful in my attempt to understand, and use the Bible effectively. Navigation in the App is easy. Can write notes, refer back to the Bible and bring in scripture into my notes without breaking a sweat. Easy to highlight key verses I need to refer to again later. Backs up notes so no fear of losing everything if one changes a device. And since links to ID, is also accessible between devices eg iPad and iPhone. I'm yet to exhaust its offerings. Great App! Love this app. It is truly in my top two favorites. I wouldn't read the Bible if not for this app. This is a top tier reading application, and I've had it for several years. This is the best Bible app, in my opinion, because it is so easy to use, and it looks great. I rank this app up there with kindle, audible, scribd, Apple's own books app, etc. download it and use it whenever you get the need to to. This is wonderful. These ease of going to different chapters and versus, being able to type notes and thoughts as you follow along makes this app phenomenal. I love the Bible app because it allows me to play the audio Bible while I am able to accomplish other things. I can also read off-line. It is an excellent application. Very reliable. Love the ease of reading this app and understanding it. Keeps my heart and mind on my faith and the Lord everyday. I love this app of the King James Bible! I love the different voices and the background enhancing sounds and music! I’m not able to see to read as well as I used to, therefore I can still get the WORD in! So enjoy this Bible App because it lets me use the version I like. And it is very accessible to doing things like enlarging the font, darkness or light background and so on. I love the way the pages turns like a regular book. I give it a thumbs up. I love this bible because it’s very motivating with the devotionals of the day and the verses of the day. One thing that bothers me thought is that the pictures are sooooooo beautiful and unique but I can’t know where they were taken. Just want to know if it’s possible to say where they were taken because I love discovering new places. Thank you for adding the audio. I love it. It adds meaning to the subject of the passages. I love the different voices. You did great!!!! This makes the Bible so accessible. I now read every day, since it’s right on my phone. Turn on notifications so that the verse of the day is the first thing you see! So much better than the news! I also love the audio (with sound effects!). Very inspirational! I am not a very technical person. I love the highlighting and Strong's Concordance where I can look up the Hebrew and Greek. I use it in conjunction ether "1 year Bible " 365 daily readings. I use the audio feature and listen to my Bible! The 1st thing I do each morning is look in your app for the verse of the day! Also I like looking up words to help find verses. All in all very helpful. Thanks & God bless! I love the audio portion. Makes my day, every day. What a blessing this app is to me! I absolutely love having the word with me at all times. The available tools make it easy to search for specific scriptures, highlight favorite verses, underscore key words and do so much more. Then there is the verse of the day, such a great way to begin each morning. Even the devotionals are great. This bible app is a great tool, and I share it with others who may be looking for one. I really like this app! Thank you for making it and for maintaining it!!! Praise the Lord! I read this every single morning and I love how I can underline and even save the verses I choose. I also love having it downloaded on my phone and iPad so I can take the Bible with me wherever I go. Thank you so much! God bless! This app is the best Bible Study app available today! I’m thoroughly impressed! I like being able to type in a few words and find a verse. It’s very helpful to do this in my ministry for the Lord work. Great App to use. It makes it easy to get your reading done. Love it and I let everyone know about it. Awesome app and my most used for studying but not my one stop shop maybe one day, keep up the good work! I have been doing a week of nothing but reading. The different devotional bibles have been so great. It’s awesome each bible has a trial version before purchasing. Also I love the daily verses and devotional readings. The only heartache I have with this app is the clickable cross references don’t show the entire verse being referenced, even though the ability to scroll is there. I would really be nice to be able to quickly view the entire verse without having to jump back and forth. Aside from that this is hands down the best bible app I’ve used to date. Great work, keep it up. January, 2018 I love the new update on the app. When listening to the bible is being read to me, there are different voices for the characters, including the a voice for Jesus. I can read 3 to five chapters a day with the help of this App. I truly enjoy studying my bible with this App. Thank you. J W Sweeney I love the bible app. I can set the print size on my IPad so that it is much easier to read than the regular bound bible. I can read it myself or set it to read to me while I also view the concise commentary on the scripture that is being read to me simultaneously. I can set my daily devotions automatically. If I have questions about a scripture, I can review multiple commentaries in a few minutes with a click of the button. I feel that I learn so much more and absorb so much more by studying with this app. Thank you for providing it. My Daily motivation to jump start my day - Every day..
Love the app. I’d like to be able to add/move/delete additional tabs and actions. For example, a tab only for my current bookmark. This is the BEST BIBLE APP!! The Bible says faith cometh by hearing.... I wish I could purchase this app so I could listen offline. Other than that its the Best and God bless you! Very handy, quick and easy! my favorite bible app! I love this app, it's almost as good as reading on paper. I upgraded to the KJV study bible and its great, I recommend it. 2 Timothy 2:15 KJV  Study to shew thyself approved unto God, a workman that needeth not to be ashamed, rightly dividing the word of truth. Great app, I love the daily verse and devotional. I only wish they had it in French as well. Love the notes and bookmarks section. They removed purchased items and data mine personal info. Very Unethical developer. I'm so glad to have so many versions available to easily switch between and to see side by side to get the full intent of the scripture. Love the ease of the devotionals and reading the associated scripture and progressing through the Bible in a year. I have used this Bible app exclusively for years. It is the best! I use this app for reading and studying the Word, I let it play continuously from the time I go to bed until I wake up, and whenever I just want to hear the Word. GREAT APP!!!! I love it, anything that educates us on God word is a blessing! It's a blessing to have access to God word at all times especially in the new times of technology. I love this app! The scriptures are so ez to get to. And though I hardly get to read it, I love the daily Scripture.. Thanks so much, and GOD Bless!!! I have been using the Tecarta app for years. I am always satisfied. It has made my studying and preparing for sermons so much easier. I always recommend it to others. I haven’t found a better and more easier to use app. Thanks to all who make it happen! God Bless! Easy to use. Would like MORE colors to use for highlighting text. Would to to be able to assign Colors to a Name. Like that I can make notes. Not only does this app have ample resources they are easy to get to. And positioned where you never leave to Bible text. The resources are inexpensively priced as well. Text attributing is easy to use. I’ve used many Bible apps and found all lacking however this one is as close as I’ve found with the right balance of features and practically. This is truly great. Scrolling is perfect, Red letter, audio, all done with the reader at heart. I love the different bible versions that I’m able use for the different interpretations . The multiple tools such highlights, notes as well as the dictionary . Hands down the best bible app!! Best add ons. Every commentary available to add. Love that I can look up every word to see the original language, definition, and number for each word right on the same page of the app without leaving what I am reading. Split screen for commentaries or for reading two books at a time. Wonderful app love everything about it! This is by far the best Bible app I’ve EVER had!! You can download the Bible, audiobook style, book by book as you choose, for free!!! There are many tools you can use for in-depth Bible study and and it’s fairly easy to look up key verses...absolutely recommend this for ANYONE looking for a free Bible app!! Love the way you can write notes without Bible disappearing. Great bible. Also love the way this bible can be used off line.